This story was reported with Roxana Olivera, a Toronto-based investigative journalist living in Peru. SOROCHUCO, Peru -- On a remote farm deep in the Peruvian Andes, in a region where sheep outnumber people by a comfortable margin, a very small woman is foiling the plans of one of the biggest mining companies in the world. Máxima Acuña, who stands just over 5 feet tall -- if one includes in the measurement the traditional wide-brimmed hat she almost always wears -- has withstood threats, beatings and legal challenges in her improbable bid to hang on to what she declares is her property: 67 acres of windswept grass framed by rolling hills and several high mountain lakes. Last week, dozens of private security officers working for Minera Yanacocha, a Peruvian company that is majority owned by Newmont Mining Corp. of Denver, ripped apart the foundation of a new home the family was building as Acuña stood nearby, crying. The cause of the conflict is the same that has haunted Peru since Spanish conquistadors first landed on its shores 500 years ago. There is gold on Acuña’s land. Or, more accurately, under it: at least 6 million ounces, here and on adjacent property, according to Newmont. The company wants to build a $4.8 billion mine, known as Conga, to extract the precious ore. Buenaventura, a Peruvian company, and the International Finance Corp., the private-lending arm of the World Bank., hold minority stakes in the project, which is meant to replace a depleted mine nearby. Acuña’s neighbors seem to have gotten the message that standing in the way of such a lucrative development is a losing proposition. They are long gone. But Acuña, who is 44, and her husband, Jaime Chaupe, have declared they won’t be intimidated into leaving. Newmont says it purchased the Acuña property and surrounding acreage from the local community in 1997. Peruvian courts have twice affirmed its ownership, the company says. Stories of individual resistance to lucrative construction projects in developing nations rarely end well for the stubborn holdout. Acuña claims Yanacocha and its security forces, as well as allied police, have engaged in a campaign of harassment. In 2011, Peruvian police moved onto the disputed property and beat Acuña and her daughter "without compassion," Acuña told the New Internationalist in an interview the next year. In more recent years, even as local activist leaders leading the fight against the mine adopted her as their spiritual leader -- at one point, she was even flown to Paris for an event -- the endgame seemed to grow near. A 2012 court decision seemed to seal the family's fate. The Acuñas, the judge declared, were squatters. Another court ruling in 2014 affirmed the same thing, the company says. In December, however, a judge in Cajamarca, the regional capital, threw out a criminal complaint that Yanacocha, backed by Newmont, had filed against the Acuñas. The family and their attorneys from a nonprofit legal group for indigenous people celebrated the ruling as vindication that their claim to the land was valid. (In Peru, private parties can sue alleging criminal conduct, unlike in the United States, where such claims are reserved for government authorities). The Acuñas live in a tiny grass and earth hut, highly vulnerable to the cold that is a steady presence at these high altitudes of more than 12,000 feet. In January -- mid-summer in the Southern Hemisphere -- they started to build a new home a few hundred feet away. On Feb. 5, Yanacocha dispatched its security forces to the site. They wore face masks and carried riot shields. What exactly happened next isn’t clear. 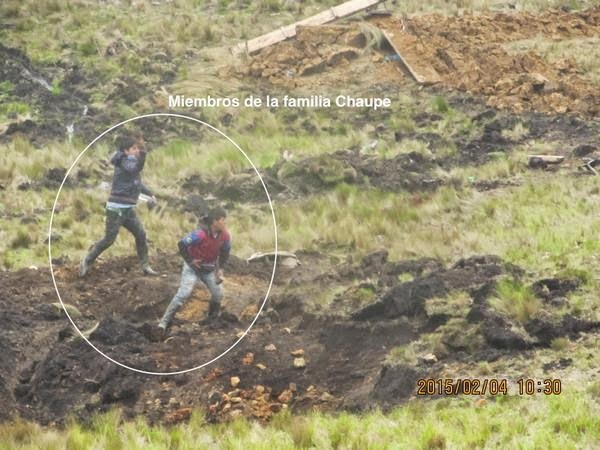 Photographs taken by the company’s agents and posted on Yanacocha’s website depict the security forces facing off against two young men. A photo tweeted from Yanacocha's account shows two people who appear to be throwing dirt or rocks. Eventually, the security forces ripped apart the house's foundation, and left. Newmont claims the new house was being built on Yanacocha land, outside the bounds of the property the Acuñas claim as their own. The December court decision changed nothing with respect to earlier rulings that confirmed its ownership of the property, the company says. "Yanacocha remains committed to demonstrating respect for human rights and host communities, and will continue to seek measures to minimize conflict," Newmont spokesman Omar Jabara said in an email. "At the same time, the company will take respectful, lawful and prudent measures to manage its lands safely, and prevent future -- and new -- unauthorized occupation on company property." The family and their attorney claim the structure was on Acuña property. Another photo of the confrontation, tweeted from the Yanacocha account. The foundation of the planned Acuña home that mine security destroyed is in the foreground; the family's current house is in the distance. In Peru, the incident has dominated the news cycle, provoking condemnation even from some media outlets traditionally seen as business-friendly. At a press conference earlier this week, the father of Peru's president declared that Acuña is a "heroine" for standing up to the mine. For Newmont, the episode is another public relations mess in a region where its reputation is already tattered. For more than 20 years, it has pulled gold out of the ground of a huge mine near Conga, a development local peasant farmers blame for polluting their water and land. In 2012, Peruvian police shot and killed five people protesting Conga, including a teenage boy. In the aftermath, Newmont declared that Conga was on indefinite hold while it builds reservoirs meant to replace water lost when several mountain lakes at the Conga site are dug up. There is no time frame on when the project will start up again, but Newmont has said it wants to marshall public support first. Now, Newmont faces the prospect of more protests and turmoil. In Lima last week, a group gathered in support of Acuna outside of Yanacocha headquarters. Lynda Sullivan, an activist who lives in the town of Celendin, near the proposed Conga site, said organizers are attempting to stage a similar rally outside of Newmont's Denver headquarters on Thursday, and at Peruvian embassies around the world. For Acuña, the mantle of resistance hero is weighing heavy. She recently sought medical treatment for symptoms relating to exhaustion and stress. In recent days, her family has sought to deflect a swarm of reporters seeking interviews. But this past weekend, she talked with a visiting journalist and issued one of the defiant declarations that have endeared her to supporters.